May 15, 2018 — Itinerant filmmakers, according to Wikipedia, “traveled across the United States in the early days of silent films to make their movies with ‘home talent.’” One of these filmmakers was a man named Melton Barker. Beginning in the 30s and running through the early 70s, Barker, much like his itinerant filmmaker collogues, did indeed travel around the United States to make films with “home talent.” Based on everything I’ve read it seems that he only produced two different films – The [CITY] Story Series and The Kidnapper’s Foil. 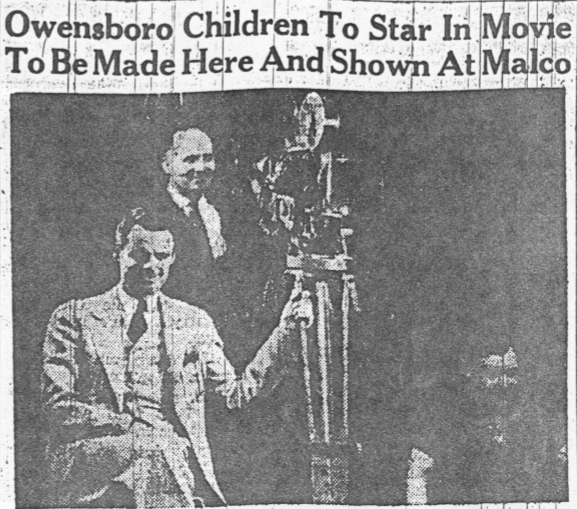 An installment of the latter was shot in 1938 in Owensboro. It, unfortunately, has been lost to the ages. We’re currently working on a documentary podcast about Mr. Barker. Since our version of the film has been lost, we thought it would be fun to get a copy of the script (via MeltonBarker.org), and adapt it into a podcast. We finished it yesterday and uploaded it to our Soundcloud page. You can hear it there or via iTunes. Check it out and let us know what you think! We hope to finish up the aforementioned documentary podcast next month. Stay tuned for that. Note: We used the original script, but, due to the format, we altered it a bit. There’s now a narration to explain some of the elements that didn’t translate well. Visit MeltonBarker.org to learn more about his work. Thanks to the folks who run that site for providing some information to us. Music: “Belgian Waffles” & “Mario” by Underscore Orkestra both appear on their record, Table Dance (Bad Panda Records). The music is licensed under a CC Attribution-Noncommercial-Share Alike 3.0 United States License. Check ’em out here; www.theunderscoreorkestra.com/.